Cupcakes 'n Daisies: It's July . . .
Time to swap out the living room quilt! I don't like to leave my quilts up for more than a month during the summer months so "Bounce" is down and "One Star Two Star Red Star Blue Star" is up! This quilt was made from the Miss Rosie's Quilt Co pattern "Cindy Lou Who", I made mine a little larger. I made the blocks larger and I even added a few blocks . When I made this quilt my intention was to put it in the middle of my bed for the month of July. But my A La Mode quilt (Lifetime Quilt # 65) is on my bed for the three months of summer so I decided to hang this quilt in the living room this year instead. 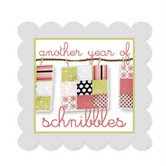 The Sherri and Sinta's July Schnibbles project is quilter's choice. If you've not made "Cindy Lou Who" I don't think you could find a better project for this month's sew-along. It was the October 2009 Year of Schnibbles project. Go check out that parade, there were some amazing finishes. So now that I'm done with "Leap Year" I plan to start working with my Minick and Simpson fabric. 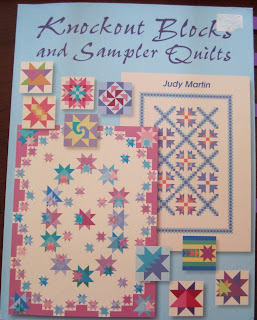 And I've narrowed my project down to two patterns, both Judy Martin patterns and both from this book. 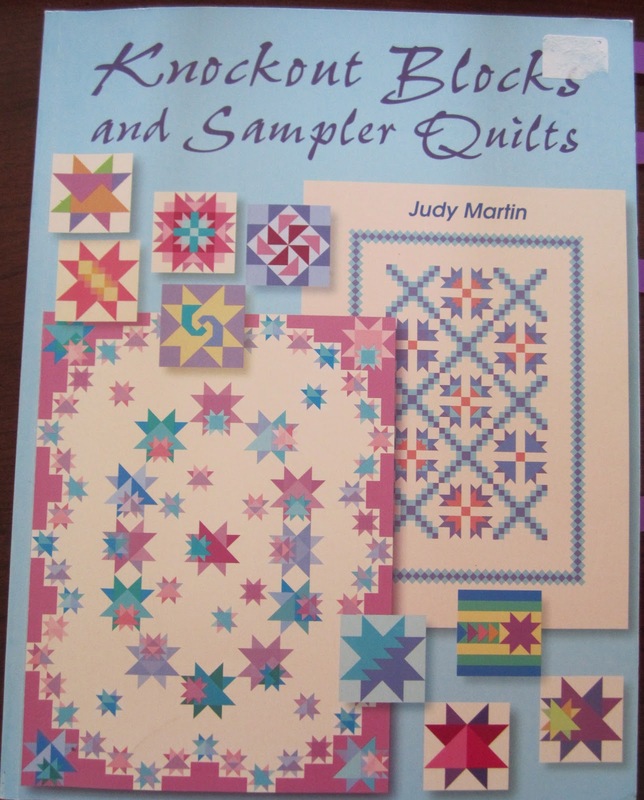 This is an old book, published in 2004 I think, but if you love star quilts you won't find more interesting patterns, stars or projects in any other book. This is "Free Spirit Medley"
And this is "Stars and Stripes Forever"
I don't think I can make a bad decision. Diane won the Bounce giveaway of a layer cake and pattern. Diane, I sent you an email, let me know your address and layer cake choice and I'll get everything in the mail to you. I let my husband pick the winning number and he chose 33, Larry Bird's number when he played for the Celtics. The majority of you said you get a bounce in your step from your family and from sewing, I'm with you there! 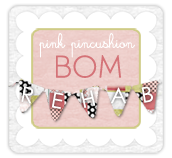 Thanks so much for stopping by, sending emails, and entering the giveaway. Don't forget, if you make a Bounce send me a picture! Tomorrow is tools day, my first tool review, stop back by. Good morning! Love your Cindy Lou Who quilt...so perfect for summer days! And yes, your next quilt is going to be wonderful, judging from those great patterns you showed us today. Now I'm off to see that Cindy Lou parade...thanks for sharing your quilt and links! Both those patterns will make a stunning quilt. I especially like the second one -have fun choosing. These are beautiful quilts. They look very changeling. I don't know weather I would be brave enough to try these. Happy quilting. I really like your version of Cindy Lou Who.... love those blues and reds and it is perfect for July! Great quilt to hang...I love it...but then I love all of your work!! Happy Monday!! Hurrah for the red white and blue/Cindy Lou Who! That is a great version of the pattern. I don't know why I don't have one RW&B quilt! The 4th is my favorite holiday celebration! I have (maybe had) that JM book from when I was new to quilting. I love those stars!!! Thelma, Go for Free Spirit Medley! Have a great Fourth of July. We had our Canada Day yesterday with perfect weather spent at my sisters cabin. I just love the two design ideas you are considering next! Love the Cindy Lou Who quilt you made and perfect for summer. Can't wait to see which pattern you decide on. Have a wonderful week! That Knockout Blocks book is one of my favorites! It's my go-to book any time I need a great block. You always make such great quilts and I can't wait to see your your next one!